On one occasion, Narada went to Lord Narayana. In the course of their conversation, Narayana asked Narada, "You move around the three worlds, what news have you brought for Me from your wanderings? Have you seen anything great in My creation?" "What can be greater than You in the three worlds!" replied Narada. On hearing this, Narayana said, "I am asking you about My creation and not about Myself." 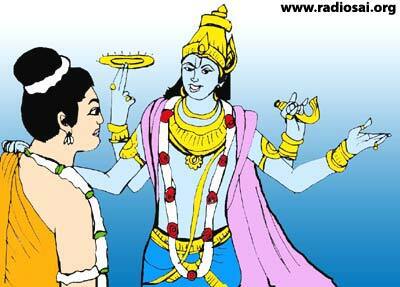 Puzzled by the Lord’s reply, Narada said, "I do not understand the question." 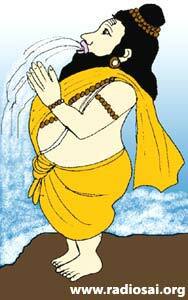 Sensing Narada’s confusion, Narayana then asked him, "There are the Panchabhuuthas (five basic elements). Which is the greatest among them?" "The earth is the biggest”, Narada replied. But not satisfied with the reply, Narayana asked, "But in the earth, is not three-fourths of the area occupied by water?" On hearing this, Narada agreed that water was indeed greater than the earth. But Narayana observed, "But since all the water in the oceans was drunk by the sage Agasthya in one gulp, who do you think is greater, water or Agasthya?" Narayana obviously had something in his mind. Narada had to but agree that Agasthya was greater. Afterall the person who could drink all of the ocean’s water in one gulp had to be greater than water! But Narayana had more in store. After Narada was convinced that Sage Agasthya was the greatest, Narayana quipped, “Agasthya is but a star in the sky. In the vast firmament, Agasthya is merely twinkling as a small star! Is not the firmament greater than the star then?" 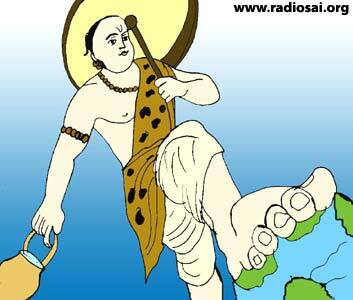 Narayana then asked, "If My foot itself is so great, am I not greater than My foot?" Narada was beginning to get the Lord’s point. He nodded in agreement. Narayana then observed, "Although I am great, I am confined in the hearts of My devotees. So, dear Narada, My devotees are greater than Myself. And therefore, wherever My devotees sing My Name I am there".